Life in the kingdom is so great. The spread of this restatement of the gospel and the life and teachings of Jesus has become a passion of mine for the last five years. It has been a journey with ups and downs, excitement, adventure, and downright fun. Have a map of your area, or use your cars navigation device, and mark out all the places or targets where you want to place a book. Make it easy on yourself and choose targets near your place of work so its not too far out of the way. 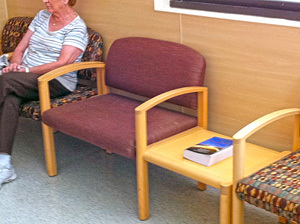 I work at a Veterans Affairs Hospital and have found that waiting rooms are great for placing a book because the people there are looking for something to read. Take nothing personally. Set aside all your fears about whether the books will be read, about who is going to find them, or about who might see you doing it. JUST GET THE BOOKS OUT! Unreasoned fear is a master intellectual fraud practiced upon the evolving mortal soul. (556.4) 48:7.4. Remember, we have the greatest revelation to hit this planet since the Master himself was here, and we have the entire spiritual hierarchy helping. They just need our arms and legs. So try not to over think it. Just do it. Enlist help. Be an active recruiter for the cause. Teamwork is the key to success in any long-term endeavor. So find someone to help you with this project. It took me two years to find another laborer for the fields, but if youre sincere in getting this revelation to the people, then with a little prayer and friendliness, the Sons celestial team will bring you a companion. Mine is a great guy named Shane Wittington, and he is twenty-three and an enthusiastic worker for the kingdom. 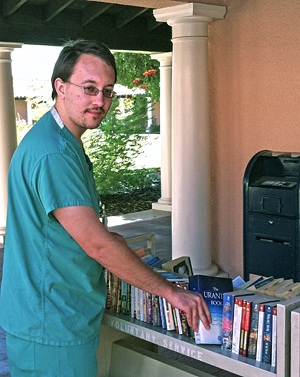 He has been reading The Urantia Book for about eight months. First, I befriended Shane. Then I introduced him to the revelation. Next I talked him into studying at my house, and all the while I was steadily placing books. After four months, he told me he had given his book away to his cousins husband. I immediately gave him two more and said, Try to keep one for yourself this time. He promptly gave away another book to his stepfather. When he showed up to study, I asked him how he felt. Of course he was excited! Stay positive. The weak indulge in resolutions, but the strong act. Life is but a days work do it well. The act is ours; the consequences Gods. (556.13) 48:7.13. Impatience is a spirit poison. (577.4) 48:7.20. So take your time, and in a couple of years you will be surprised how much you will have accomplished. You really do not have to talk to anybody about The Urantia Book when you do it this way. Remember that the sower was not an agronomist or a horticulturalist either. He threw his seed on rocky ground and on fertile soil. It is just our job to get the books out so other men and women can find their way to the truth. I had the greatest thing said to me by a man at work the other day when he said that his wife had found The Urantia Book in the waiting room, and they both started reading it. He went on to say that I was really going about it the right way because, if someone had come up to him and tried to tell him about it, he would have blown them off. But this way, a person could find it on their own and make up their mind without someone shoving it down their throat. No pamphlets if you can help it. Most people will look at them briefly and then throw them away. Pamphlets just link The Urantia Book to other mainstream religious organizations which use tracts to browbeat potential kingdom believers. That leaves a bad taste in their mouths. Remember to be as wise as serpents and as harmless as doves. Keep your eyes open. Whenever I travel anywhere, I am always on the lookout for new places to place books. This is something that really has not been pursued at all, and most people will be surprised to see a nice hard cover Urantia Book in some of these out of the way places. Their Thought Adjusters are hoping they can catch their subjects off guard like this. Enjoy, and remember, each of us can make a difference if we will just get out and do it!